Every now and then, a reader emails me with an idea for a sushi recipe. I always do my best to respond to every email, and I’ll usually ask the reader if they mind if I make the sushi and post about it. Unfortunately, sometimes it can take a while for me to get to making the sushi, and then sometimes even longer for me to get around to posting about it. Such is the case with this roll. The verdict? This was delicious. The flavors all meld together incredibly well, and the sharpness of the onion is gently softened by the smoothness of the avocado, cream cheese, and smoked salmon. I love this medley of ingredients in this Salmon Summer Sushi, just as I loved this combination of flavors in the Salmon Summer Rolls. P.S. I have an awesome contest going on over at Fridgg, where you can win some delicious garlic sauce! So head on over there and be sure to enter! Slice the red onion into thick rings. Slice each ring in half. 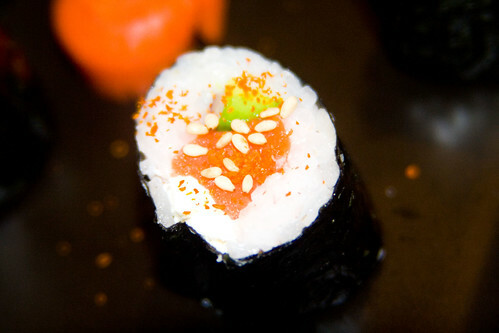 Roll the sushi, using avocado, some cream cheese, a few slices of red onion, and some smoked salmon as your fillings. My daughter and I discovered our total love for sushi (and Sushi Day!) over 2 years ago and now we have it at home at least 3 times a week in some form or other. In Minnesota it is very hard to find quality ingredients especially this far north. One of our own favorites we make is with smoked salmon, blue cheese crumbles and cucumber. Roll this inside out and sprinle with toasted sesame seeds. YUMMMM! Thanks for all you do. Love the Hawaii pics and can’t wait to get my hands on some mochi other than what we make. We Finlanders may lose something in the translation ……. Not too big a fan of cream cheese in sushi, BUT if you don’t use too much, I think I could take it. Yummy! I will love to try this dish and surely it will give me a fantastic taste. Made this and the mango-salsa roll last night and was in heaven. Absolutely delicious. I have moved beyond the california roll! Sheila – Oh wow, thanks so much! That’s so great to hear. 🙂 That roll you make sounds delicious, I’ll have to attempt it sometime! 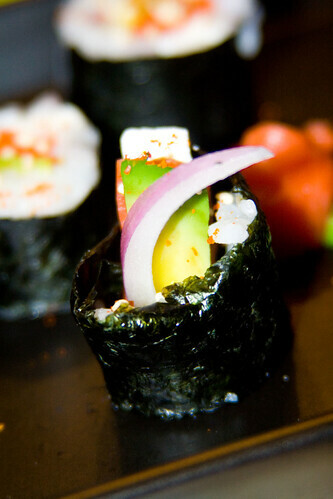 Anonymous and sushisushi – I agree, cream cheese is only good in sushi when you use it sparingly. I definately like it with blue cheese! You could even substitute your above recipe’s cream cheese and I bet that would be great!